Month by month, where are robins and what are they doing? 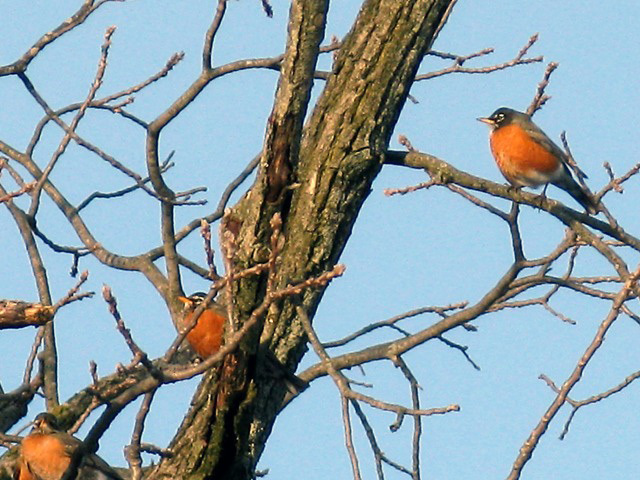 Explore the annual cycle to discover how robins respond to the seasons. Robins in winter are found from north to south. Some are basking in south Texas and Florida while others are enduring the northern winter. Many are somewhere in between. As long as they can find fruits or berries, some may stay close to their summer areas even in fall and winter. Because they move in search of food, robins are not as faithful to their wintering grounds as most other songbirds. 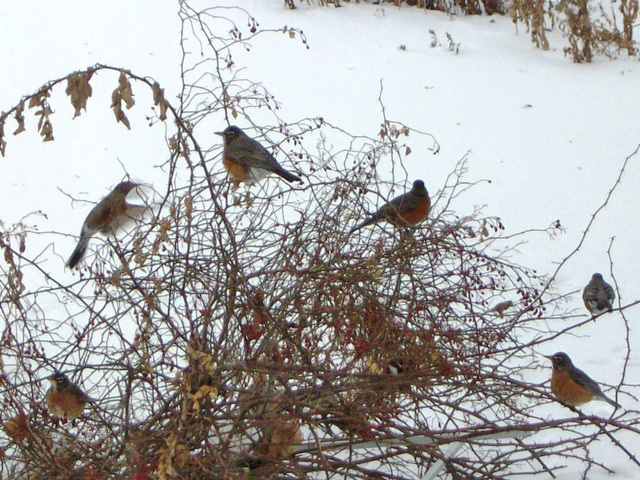 Winter robins wander in flocks and they help one another find food and avoid predators. 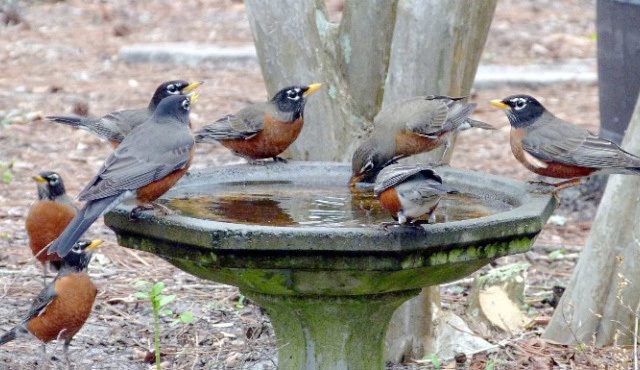 By February, the largest numbers of robins are in the south where they still find fruit. Increasing sunlight triggers an urge to return north. Robins are getting restless. Depending on available food and favorable weather, some flocks begin to journey north. March is the peak month for robin migration. Waves of robins are moving north as the ground thaws and earthworms surface. Males return first and claim a territory. Females come a few weeks later. The male's territorial song is a welcome sign of spring for winter-weary northerners. 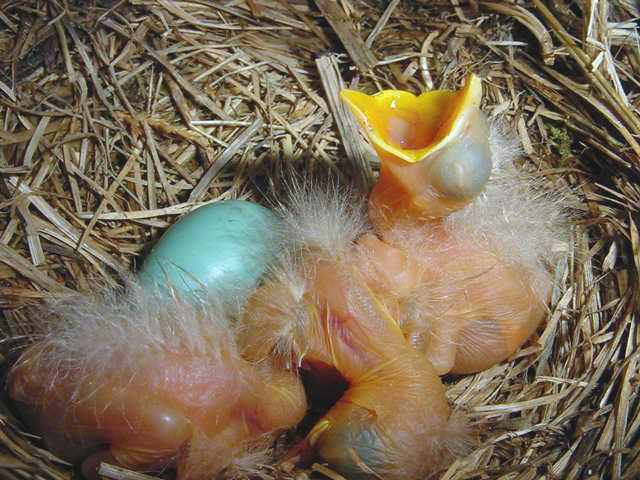 The very first nests are reported in states such as Kansas and Virginia. In April, some robins may still be migrating to the northernmost breeding range in Alaska, but most robins are on home territory. Gone are the social flocks of winter. Robins are now territorial. The melting snow and April showers mean wet, muddy ground. Mud + dead grass + worms = ideal conditions for nesting. Mates work together to build a sturdy nest in which to lay their eggs and hold their chicks. It's May and first brood of chicks have hatched. Always on duty, robin parents work as a team. 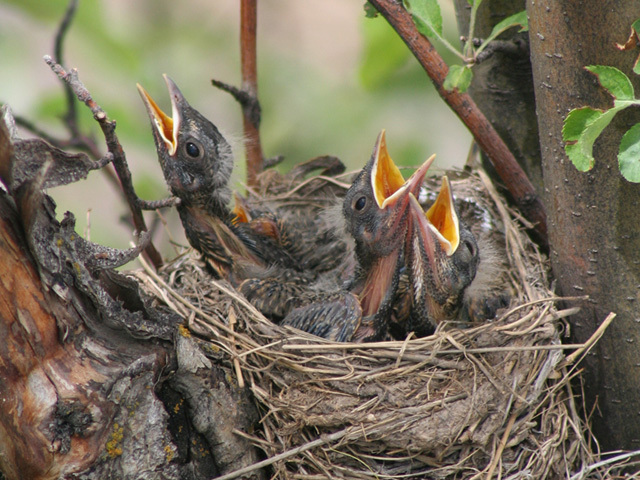 The dependent nestlings need their parents to feed, shelter and protect them. When nestlings fledge, both parents continue to bring them food until Mom starts building a new nest for the next clutch of eggs. The fledglings stay with dad to learn important skills. Both parents are critically important to the survival of their chicks. 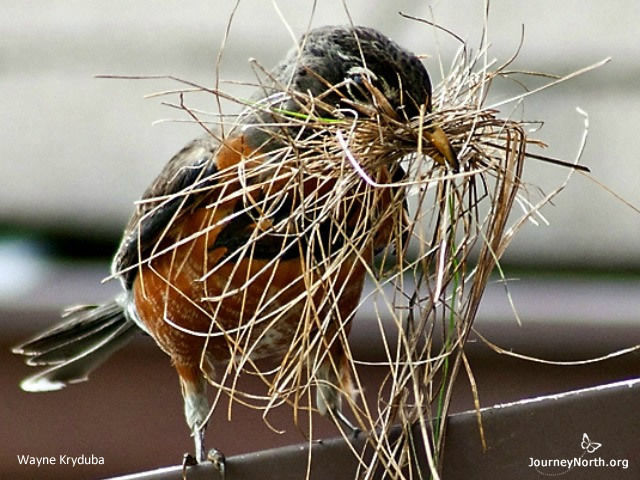 Nesting season is in full swing as June begins. Robins will have two or three broods each summer. Caring for nestlings for 11-13 days, the two parents will feed each chick an average of 356 insects and 14 feet of earthworms! During summer, robin parents work from sunrise to sunset raising two to four broods. Newly fledged robins need time to grow and learn. Dad teaches them to forage for food, recognize dangers, and roost in trees with other robins. Few robins start new nests after late July. Caring for babies takes so much time and energy that migratory birds can do this for only a short time in their annual cycle. As the adults' hormones decrease and territorial feelings diminish, robins sing less and the chorus quiets. By August the weather is drier, worms are harder to find, and fruits are ripening. Juvenile robins are independent. They watch how and what other birds eat as new food sources continue to ripen. 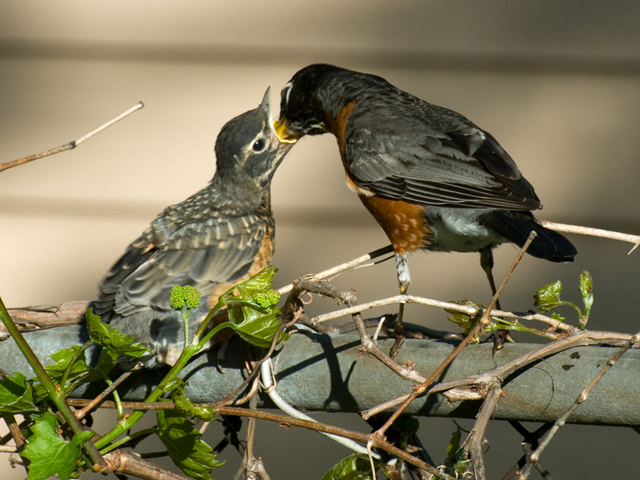 Appetites of all robins increase as they fuel up for migration. 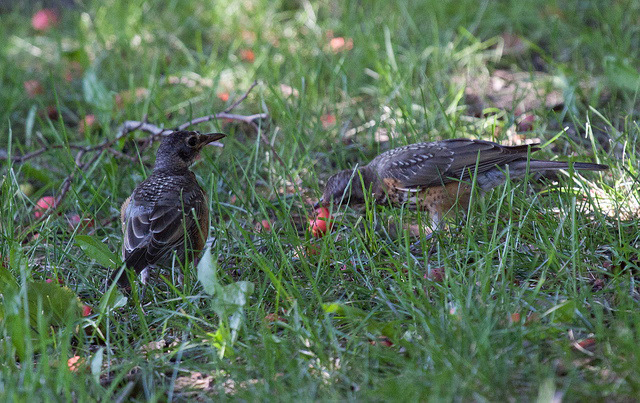 They start forming flocks with other robins, young and old. Adults molt. Their new feathers will stand up to the rigors of fall migration and winter wandering. It's September. Robins that had three or four broods may still be raising young. As day length grows shorter, robins become restless and social. 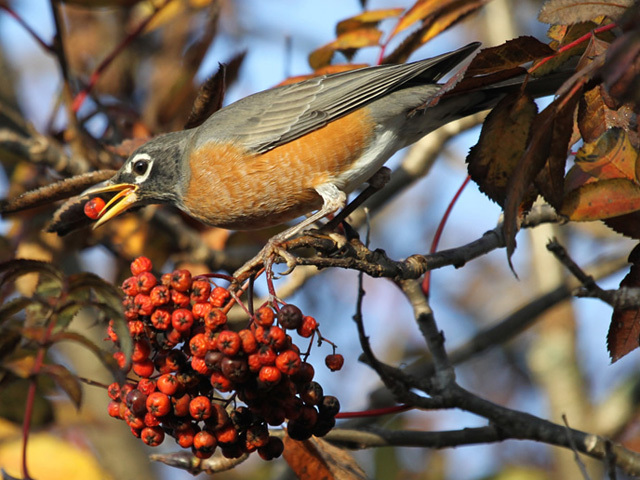 Flocks of robins are on the move, filling up on plentiful fruits and juicy berries. They are building up their body fat as fuel for fall migration. October is the month of heaviest migration. 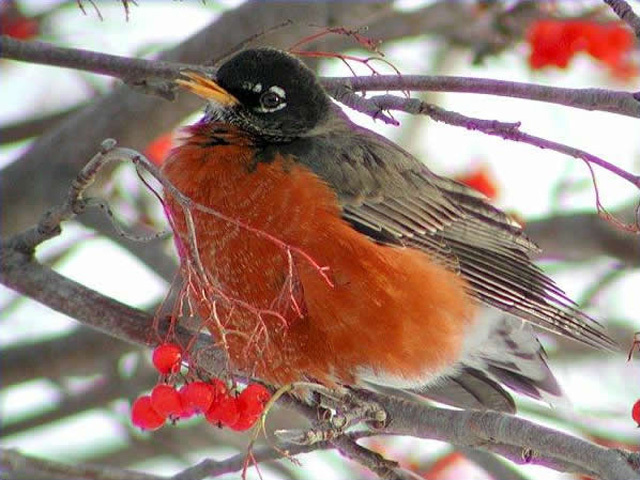 Most robins fly south in winter; however, some stick around—and move around—in northern locations where food can be found. The robins that stay will have the advantage of first choice of best territories in spring. 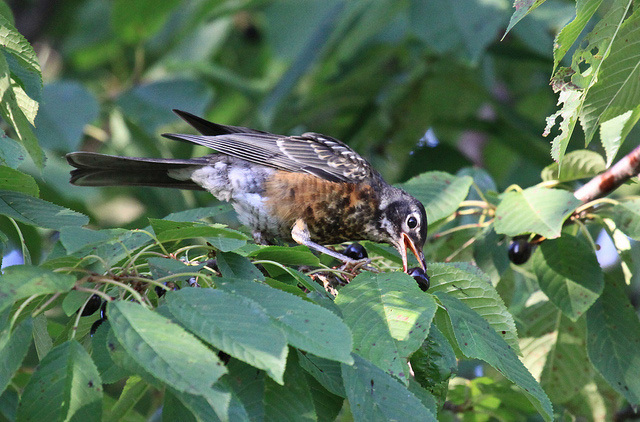 Meanwhile, migrating robins find plentiful berries all along the journey south. Robins don't migrate on a particular route but fly in flocks, looking for food. Down feathers grow under outer feathers, adding extra insulation against winter's cold. During November migration is well underway, and it never really ends. Robins are on the move throughout autumn, winter, and early spring. Winter robins are social and travel in flocks, relying on one another to find food and watch for predators. Robins now spend more time in trees than on the ground. Fluffing out their down feathers keeps them warm in cold temperatures. In December, robins face diminishing food supplies and harsh weather. Finding food is essential for winter survival. Robins take wandering flights to search for fruits, and are now more common in the south than the north. 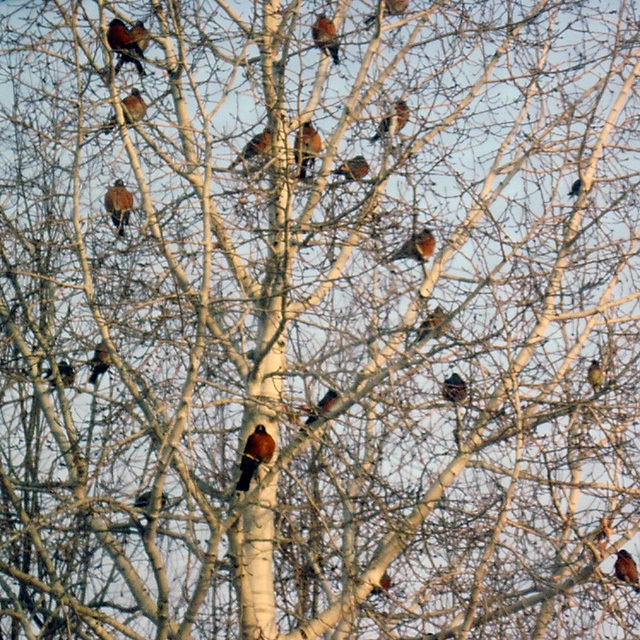 Some observers report flocks of hundreds and thousands of robins!